WAYS TO WINAuthor D.C. Stewart is giving you a chance to win a copy of WHERE WOULD COWS HIDE?, and more! Here’s how to enter for a copy of WWCH and to enter the grand prize drawing: 1) leave a comment on this blog post (or on any of the blogs participating in the blog tour); 2) email the contest coordinator at contest@novelinspirations.com with subject line “WWCH ENTRY”; 3) join D.C. Stewart’s ezine list by either sending a blank email to: dcstewart_ezine-subscribe@yahoogroups.com or visiting http://groups.yahoo.com/group/dcstewart_ezine/ and subscribing through the yahoogroups page. Book winners and the GRAND PRIZE WINNER will be drawn on or before May 31st, 2008 and will be notified by email. Please make sure you leave a valid email address on applicable blog posts. **How did you come up with your characters, Charlie and Brad? A combination of what my brother and I were like as kids, the stories I heard about my husband and his twin when they were kids, and how I imagined my own twin sons acting when they reached eleven years old. **Do you have experience living or working on a farm? Any funny stories related to that? Everyone on both sides of my family are farmers, doing a combination of growing wheat and raising cattle. Our house was in town, but we spent most of our time, especially in the summer, on tractors, combines, wheat trucks, in pick-ups, and working cattle. The only funny story I can think of about me is helping my dad, mom, and brother one morning feeding and counting the cows. The cattle all came into the lots except one, and my dad told me to hurry and open the gate to let her in before the other cows could get out. As I pulled the gate open and trotted backward, I tripped over a concrete block used to hold the gate in place, and got hung up in the chain. I was stuck at such a weird angle I couldn't get myself loose and all the cattle were rushing at me to get out. I was kicking and waving all over the place trying to keep them back, but my family thought I was panicking because I was stuck. They still give me grief over that one. **Brad and Charlie have a quirky younger sister who sometimes drives them crazy. Do you relate? I have a younger brother who used to drive me nuts all the time, but we were also the best playmates because we are so close in age. I have friends who were the "younger sister" and I remember them getting yelled at by their older siblings all the time. **Brad and Charlie stay at their grandparents for an annual summer vacation. What's your favorite place to vacation and why? Honestly, I don't really have a "favorite" place to vacation. We didn't have the opportunity to travel much when I was a kid, so ANY vacation is awesome to me. I love to travel, eat different foods, take in the scenery, watch the people. It's all new and exciting to me. **As a writing mom, how do you juggle the demands of your kids and your career? With great difficulty. I have a wonderful and supportive husband who gives me time in the evenings and on weekends to write. Usually if anything suffers between my writing and taking care of the kids, it's our house. I'm more of a relaxed housekeeper (fancy title for slob), and I only move on the housework if there are no clean clothes, we have to order out because there is no room to cook in the kitchen, and if I walk across the floors and they crunch. AUTHOR BIO D.C. Stewart grew up in a small town in Oklahoma, and spent most of her childhood getting into trouble with her younger brother on their ranch. She began writing short stories in high school, and won a writing competition at a nearby college at age 17. After graduating, she attended Northwestern Oklahoma State University and earned a degree in History, and also met her husband, Scott. She worked for a church in Maumelle, Arkansas as the Communications Coordinator for five years. After moving back to Oklahoma, she chose to stay home with their four year old twin boys, and six month old baby girl, and to pursue her dream of being a full-time writer. The Stewart’s live in Oklahoma City, Oklahoma. Where Would Cows Hide? is her first novel. Title: WHERE WOULD COWS HIDE? Brad and Charlie Parker are less than excited when their parents announce a change in vacation plans. The twins start voicing all kinds of objections before they even found out what the plans were. When they discover that their parents are going to Hawaii with out them and leaving them with their grandparents for three weeks, their dismay turns to excitement. If only their annoying little sister, Zoey, didn’t have to go along. When Brad and Charlie arrive at their grandparents’ ranch, they discover that someone has been cattle rustling, and they are missing three prize bulls. The twins are convinced that they can catch the rustlers, but their grandfather is stern and won’t even consider letting them try. When the boys overhear strangers talking in the barn, they know they’ve stumbled upon the rustlers. But who are they? And how can they solve this mystery when they are thoroughly confused. WHERE WOULD COWS HIDE? is a real cute story geared toward boys ages 8-12. My son would have loved this book when he was a tweener. Girls will enjoy this story too, but the focus is more toward boys. The setting and the mystery are both attention grabbing and it held my interest to the end of the book even though I figured out who the rustlers were right away. Dani Richards was looking forward to the night at the theatre with her aunt. But during intermission when Dani stepped out to talk with the lady in the box next to hers, she finds her acquaintance murdered—and she hadn’t seen or heard a thing. Caleb Jamison is a detective in the Lincoln police force, and investigating a murder at the theatre is proving frustrating to say the least. No one in the crowded theatre had seen or heard a thing—and the prime suspect in the murder is Dani, a woman he loved back in high school. Dani is trying to cover the case, but now the killer is stalking her. Caleb insists on providing protection, but Dani is afraid of letting him close to her. But does she even have a chance at outsmarting the killer? DEADLY EXPOSURE is the first book I’ve read by this talented newcomer to Love Inspired Suspense, and it’s a good one. The story is expertly developed, the suspense evident from the beginning, and the action non-stop. Dani is a realistic heroine, skittish around her former boyfriend, and Caleb is a strong, capable hero who goes above and beyond the call of duty. The faith message is not preachy. I enjoyed this suspense, but I figured out who did it pretty early. Don’t miss DEADLY EXPOSURE. Discussion questions are included at the end of the book. $5.50. 218 pages. Lily Reese doesn’t plan to settle in Browning City, Iowa. She’s only there long enough to save enough money to escape to a big city. Someplace that is all hustle and bustle, with something to do and someplace to go every minute. She has her heart set on Matt—he travels with the railroad and is in line for a promotion in the near future. Ben Purcell is looking for family—and he’s thrilled to have found an elderly great-aunt. His arrival in town isn’t quite what he expects though as soon as he gets off the train he’s shot. Lily is upset by Ben’s arrival. She’s displaced from her home when he needs to be nursed back to health, and not only that, but he’s working havoc on her heart. Rumors of a long-lost cache of gold adds danger—but also puts them on a quest. Will they be able to release their plans—or will they end up with heartbreak? BETTER THAN GOLD is the first Heartsong Presents published by this talented author, but I expect to see more from her. Lily is a wonderful heroine, loveable and outgoing, reaching out to everyone else. Ben likewise goes above and beyond the call of duty, reaching out for others. The writing is impeccable and the setting is brought to life. The faith message is strong, but isn’t preachy. I thoroughly enjoyed reading BETTER THAN GOLD, which is the third story in the Iowa historical collection. The first two books in this collection were written by Lena Nelson Dooley and Lisa Harris. Readers will want to read all three in the collection. Laurie Alice does a stellar job of tying up all the loose strings in the series and brings it to a satisfactory close. $4.95. 170 pages. About the book: What better way to tell Mom how much you appreciate her on Mother's Day than with this lovely reminder of thoughts about the loving, selfless attitudes that fill a mother's heart? The text and original four-color illustrations will be a beautiful and touching reminder to Mom that her love is never forgotten. The text is a reminder of those things that only a mother's heart knows, with some special emphasis on a Christian mother. Appropriate Scripture verses will be incorporated into the design element. All royalty proceeds from this book go to WINGS (Women In Need Growing Stronger) and a student missionary scholarship fund. WINGS is a non-profit organization that provides a domestic violence shelter for women and their children in addition to transitional housing and programs. About Margaret: Margaret lives with her husband and two daughters in a Chicago suburb. Her book, A Mother’s Heart Knows was published by Thomas Nelson in 2005. Go Back and Be Happy, a co-authored book will be published by Lion Hudson in July 2008. Margaret has been featured on Greg Wheatly’s “Prime Time America,” TLN’s “Aspiring Women,” and LeSea’s “The Harvest Show.” Margaret writes freelance articles for The Daily Herald, the largest suburban Chicago newspaper. Notable interviews include Wolfgang Puck, Thomas Kinkade, Susan Branch and Dr. John Gottman. Margaret also wrote a feature article for crosswalk.com. With a master’s degree in international business, Margaret became a vice president in the corporate finance division of a New York City bank and worked there from 1986-1993. Supporting charitable causes is important to Margaret. For the past five years, she has served on the board of directors for WINGS, an organization that helps abused women and their children get a new start in life. About the contest: The "My Favorite Mom" spa basket contest. In honor of Mother's Day, Margaret would love to hear and share your favorite story about your mother (or someone who is like a mother to you). To enter the contest go here and share your story to win one of TWO fabulously scrumptious spa baskets! She will be posting the stories (with your permission of course) on her blog. 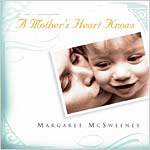 Oh, if you leave a comment on this post (http://margaretmcsweeney.blogspot.com/2008/04/my-favorite-mom-blog-tour.html) and you'll be entered to win a signed copy of A Mother's Heart Knows for your very own! A mother’s heart knows that her child comes from above. A mother’s heart knows when to hold her child’s hand. A MOTHER’S HEART KNOWS is the perfect gift for any mother. Mother’s day is fast approaching and this little gift book is just the right size to warm your mother’s heart and make her feel loved and cherished. Filled with adorable pictures of babies and young children, as well as a few words of thoughts to go with each photo, this book is sure to be a winner. This book will be the ideal book to get for the favorite mother in your life for Mother’s day. Let her know how special she is with this book—a gift that will outlast flowers and chocolate. $9.99 hardcover. COACH takes coaching off the playing field and into the church setting. This book will effectively assist small group coaches with step-by-step tools. The author shows the cell leader how to grow and multiply their cell groups. Coach Comiskey uses the word “coach” as a description of the role the leaders will play to support those under their care. He intends for COACH to show the way from the initial stages of the group, all the way to giving birth to a new one. Easy chapter is easy to read and includes plenty opportunities for the reader to interact with the book. Lines are included in each chapter for writing your thoughts about scriptures that Coach Comiskey references or other ideas that he has. This book also includes memory verses and opportunities for applying the work to your life. COACH will be excellent for any small group leaders and even for ministers in small churches. It is perfect for church libraries. $9.95. 91 pages. Gemologist Andie Adams is happy to quit her stress-filled job in New York City and jumps at the chance to go home to Kentucky to take care of her quirky Aunt Weeby. Things are definitely a slower pace in Kentucky—right? Wrong. Aunt Weeby’s best friend, Mona, instantly hires Andie as host for the Shop-Til-U-Drop Network’s jewelry and gemstone show—along with a drop-dead gorgeous jock who knows nothing about jewels. A dead body, missing gems, explosions, and international investigation is almost enough to make Andie wish she’d never left New York! PRICED TO MOVE is book one in the Shop-Til-U-Drop Collection. I loved this book, and couldn’t turn the pages quick enough. It’s a fun, quirky, chick lit with more than a touch of a cozy mystery. The writing is fresh, the faith message is expertly woven in, and the action keeps the pages moving. Andie is a realistic character that is real. The secondary characters each have their own distinct personality and contribute to the story. Readers aren’t going to want to miss PRICED TO MOVE and A Steal of a Deal, available now. $12.99. 255 pages. Your story is about a mother whose daughter was switched at birth. How does Marty find out that her child was switched?Marty's daughter, Ginger, is the victim of a fatal genetic disease, Neimann Pick Type C, which often strikes every sibling in a family. Marty is concerned for her other 2 daughters, and when it's determined that she and her ex-husband are not carriers of the disease they know something's not right. Where did you get the idea for your story?My inspiration for the book came straight out of real life from a news story I heard about two families fighting over switched-at-birth babies when one child is orphaned. Of course, the circumstances and setting in my story are different, and the characters are completely fictitious. But I knew it would be a heartbreaking dilemma for any parent, especially for one who had suffered through the death of a child she thought was hers. Do you have a favorite character? I would have to say Andie, because even at 13-years-old, she doesn't become a victim. She's a little quirky, and she's had to mature quickly. Even though she's developed an attitude toward God and her situation in general, she keeps it to herself most of the time, and we understand her need to vent occasionally. On what level do you think women will identify with Marty, her biological mom?I think most moms would understand the panic of discovering they had the wrong child, and the guilt at not realizing instinctively that something was wrong all along. On another level, Marty is a caregiver who sets aside her own dreams to nurture her family. As women, we often set aside our dreams out of necessity, guilt or lack of support from our families, but like Marty, we don't have to abandon our dreams completely.The story is set at a drive-in movie theater. What led you to choose that setting?I think there's a nostalgic winsomeness about drive-in theaters and I want to encourage families to take advantage of the few drive-ins that are still in operation. I remember the smell of hot coffee when my mother poured cups from the thermos, and falling asleep in the backseat with my pillow and blanket. There's a sense of intimacy and togetherness that comes from being alone with your family, even though hundreds of other people are watching the same movie. I also used the run-down condition of the Blue Moon Drive-in as a reflection of the relationship between Marty and Andie and of the condition of their spiritual lives when they first meet.What is the meaning behind the title: Tuesday Night at the Blue Moon?Tuesday night is family night at the Blue Moon Drive-in. Andie needs a family, and the desire of Marty's heart is for her dysfunctional family to be a whole again.Who are some of the other interesting characters in your story?Andie is sandwiched in the birth order between Winnie, the needy younger sister, and Deja, an older teen who is bitter about the situation. Some interesting dynamics that take place when the three of them interact, especially when mom has to work long hours and there's too much unsupervised together-time. What is the message that you would like your readers to take away from Tuesday Night at the Blue Moon?I believe that God is our Father and that we were created to commune with Him on a deep level, but sin orphans us. When we're open to it, God is ready and willing to re-claim and restore us as his children.How did you begin your writing career?I operated a home day care for 6 preschoolers when my children were young, and I was in desperate need of a distraction to keep my sanity. So I began to write a novel during their naptimes. I finished it in about 2 years. It was my 'practice novel' which gave me confidence and helped me plot the blueprint for Tuesday Night.What advice would you give to someone starting out as a writer?Don't quit. I sold the first article I ever sent to a publisher and didn't sell another thing for 19 years. It's not going to happen overnight. It's an apprenticeship - a craft to be honed. When you're tempted to give up, remember the encouraging things other writers, agents or editors have said about your writing. If God has given you some talent, what acceptable excuse can you give Him for not using it? "I am passionate about good fiction, the kind that grabs you and won't turn loose. My hope is that my characters will capture you and that you will consider my stories old friends with whom you visit often." Ivy Samantha Towers is forced to return to Winter Break, Kansas, to make funeral arrangements for her Aunt Bitty. Ivy is suspicious that her aunts death is not accidental when she discovers that Aunt Bitty had fallen from the ladder in her used bookstore. Her suspicions are realized when someone leaves a note on an envelope stating that Aunt Bitty was murdered. Ivy immediately begins to make a list of suspects—and in a small town, that is virtually everyone. Ivy’s childhood friend, Amos Parker, is now the Sheriff of Winter Break, but he seems to be warning Ivy to leave town. Why? A missing book and an extra coffee cup leave more questions than answers. IN THE DEAD OF WINTER is the second cozy mystery I’ve read by Heartsong Presents, and it is really cute. I like the winter setting, the small, used bookstore, and the small town. Everyone seems to be really friendly, and Ms. Mehl certainly has the small town mentality down. Ivy is a realistic character, curious, yet intelligent. The cast of secondary characters are also strongly developed, each with their own unique personality. The faith message is expertly woven in and isn’t preachy. I enjoyed reading IN THE DEAD OF WINTER and look forward to reading more by this talented author. A yummy sounding recipe is included at the end of the book. $6.95. 239 pages. Publisher: Words of Wisdom Ministries. THE LADY IS A LEADER is a small booklet that addresses leadership in a lady. But not exactly leadership as in you have to be boss, the head honcho, etc, but instead how to be a leader in how you approach life. First, this booklet teaches the reader what a lady is, behaves, how she talks, etc. Then it moves on to address relationships, and the price we pay for love. Dr. Relefourd explains what real love is vs. the relationships some women put up with when they are searching for love. As you grow, you will experience periods of destruction, where negative comments hurt you, or the going gets rough. Dr. Relefourd shows us how to handle these times and shows us that there is nothing that God can’t handle. Then there are the hidden issues that must be addressed. What is inside us? Are you lonely? Hurt? Angry? All these things must be addressed, and we are shown in scripture how to tackle these issues. Then finally, we learn how to take control of our lives in the way a lady should. I enjoyed reading this well-written booklet. It almost seemed as though I were sitting in a class with Dr. Relefourd teaching and I should be taking notes. I highly recommend this book for all women, pastors wives, counselors, etc. Anyone who wants to make a difference in their life, the lives of their family members, and their community. $12.00. 44 pages. Lucy DiCamillo is convinced she’s killed her mother. After all, her mother, Ruby, asked for her inhaler, but Lucy took the time to finish up the job she was doing before she got it for her mother. By then, it was too late. Lucy’s grandmother, Kitty, takes Ruby in, but Kitty seems to shield Lucy from the memory of her mother. Lucy knows Kitty can tell her more about her mother, but when Lucy asks questions, Kitty hushes her or gives round-about answers. As Lucy grows, she graduates with her masters, and she has her books, music, and art—and an elusive memory of a mother she wants to know more about. So Lucy goes on a quest that leads her from San Fransisco to Sacramento to the lush vineyards of Sonoma Valley. RUBY AMONG US is Ms. Forkner’s debut novel. As a rule I don’t like stories that start with death, I find them way too depressing, and RUBY AMONG US starts with death. So it was a struggle to read this book. The story is well-written, even engaging, and I sympathized with Lucy. I know how hard it is to lose a mother and how as an orphan, one reaches to grasp any memory of their parent they can. I couldn’t understand why Kitty refused to talk with her granddaughter about Ruby. It would have cleared up a lot of Lucy’s questions—but it fueled a desire in Lucy to learn as much as she could—and that was admirable. Discussion questions are included at the end of the book. $9.99. 336 pages. Delia was born a slave. The Civil War is over, but Delia isn’t sure what to do. All she knows is that she wants to get away from the cruelty of her master. She runs, expecting capture at any time. Instead, she runs into a little band of former slaves making their way north. Ezra Johns was born free, and he fought with all black Union soldiers. But he’s gotten separated from his unit. He is making his way north to Boston when he meets up with Delia and her friends. Ezra promises to see them safely to Boston—but knows he must lose his Union uniform in the south, because the returning Rebel soldiers hate him, and his kind. When Ezra is separated from his new friends, another black man offers to lead them. But instead of taking them north, he takes them south, to a white woman who seems to want slaves, even though the war is over. Trouble brews for the little band of former slaves. Will they ever make it north? THEN CAME HOPE is book two in Louise Gouge’s civil war series, but it easily stands alone. Delia and Ezra were realistic, and very well developed, as well as the secondary characters. I would have liked to have met up with some of these characters and gotten to know them in person. The faith message is expertly woven in and is not preachy. I found myself hoping that Delia and Ezra would be able to find their way to freedom—even if it isn’t exactly what they dreamed. These characters had me cheering for them from page one. Excellent job, Ms. Gouge! Discussion questions are included at the end of the book. $14.99. 381 pages. Professor Rich Harrison is looking forward to a relaxing weekend at Lone Rock, an estate owned by Rich’s female boss. Rich has been harboring some romantic feelings for Roberta, so he is hoping that this weekend will give them some time alone together to talk. Rich brings along is friend and colleague from India, detective Chinni Roy. Roberta has invited several guests, and in the wee hours of the morning the first night everyone is there, a shot rings out, and an Englishman is murdered. His wife is found holding the murder weapon. It seems like a cut and dried case—but things are not always as simple as they appear. The police come out and with Chinni’s help interview each of the guests. Rich learns a few lessons about sleuthing from his detective friend, using algebraic formulas. Who will find the murderer first? The police, or Chinni? MYSTERIOUS INCIDENTS AT LONE ROCK is the first Heartsong Presents Mystery I’ve read. At first I wasn’t real impressed. The first three chapters seemed to drag. However, by the time I made it through the fourth chapter I was hooked and I had to find out who-dun-it. All the characters seemed to have secrets that they wouldn’t tell—so they all appeared guilty. I guessed early who might have done it, but I guessed wrong. MYSTERIOUS INCIDENTS AT LONE ROCK reminds me a lot of the popular children’s game, Clue, where characters move around the board. Only thing is, we know the murder weapon, we know where the murder was committed, but we don’t know who did it. The characters were all realistic developed and the faith message is expertly woven in. I thoroughly enjoyed MYSTERIOUS INCIDENTS AT LONE ROCK and would read more by this author. If you like cozy mysteries, don’t miss this book. $6.95. 248 pages. Andrea Carter and her friends, Cory and Rosa, are out riding their horses and planning on going fishing when they discover a man half drowned in the river. Cory and Andrea pull him out, and discover that he’s a gambler. He refuses to go to town and asks Andi to bring him some grub every day and he’ll be fine. When Andrea returns to her ranch, she is horrified to discover that she has a sister she never even knew existed. Kate has three children, and her oldest one is almost as old as Andrea. The three children are rowdy brats, and Andrea isn’t quite sure how to handle them, especially when she finds herself in the middle of unexpected scuffles. Andrea is angry and hurt when she discovers Kate. Why has her family never told her she had a sister? Why was Kate such a big secret? ANDREA CARTER AND THE FAMILY SECRET is the third book in the Circle C Adventure series, but it easily stands alone. Tweener girls will identify with Andrea, and feel almost as though she is their friend. My twelve-year-old daughter loves these books because they have horses in them. Andi Carter is realistically developed, and the scrapes she gets into are sometimes amusing, sometimes quite serious. I figured out part of the mystery in this book quite quickly, so I didn’t have any surprises. Pick up your own copy of ANDREA CARTER AND THE FAMILY SECRET today for your favorite eight- to twelve-year-old girl. They will love this book, and the previous ones in the series. $7.99. 140 pages. Will Sullivan is tired of his city life, and to escape midlife blues, he decides to buy an abandoned resort in northern Idaho. He talks his wife, Merit, into joining him, though she is less than enthusiastic about the venture. He hopes that their son, Michael, fresh out of the military will also join them, but Michael is not excited about the idea. In fact, he worries that his parents have bitten off more than they can chew, especially after he sees exactly how much work this resort needs to go back into business. When Merit discovers she’s pregnant at the age of 45, she is shocked. It seems too much to bear, until devastating news forces an even bigger decision. As Merit and Will face the greatest trial of their lives, they are forced to reexamine their devotion to each other and to their faith. LIKE ALWAYS is inspired by a true story—a fun type of book for me to read. And Robert Elmer is just the person to write this story. He is known for writing complex, satisfying books that will stay with the reader for a long time to come, and LIKE ALWAYS is no exception. Will, Merit, their children, and the secondary characters are all so very well developed, they almost seem real, like neighbors I could walk down the road and visit. I fell in love with each of the characters, and couldn’t wait to see what happens to them. The faith message is expertly woven in and isn’t preachy. I thoroughly enjoyed LIKE ALWAYS and highly recommend it – as well as any of Robert Elmer’s previous books. $12.99. 304 pages.